"Newport, Rhode Island, that breeding place--that stud farm, so to speak--of aristocracy; aristocracy of the American type." More than a few movies and books have been written about it. Just as more than a few American presidents have made it their 'summer White House' and socialites like Sunny Von Bulow and Doris Duke have imbued it with a healthy dose of scandal that has only added to its allure. Why? 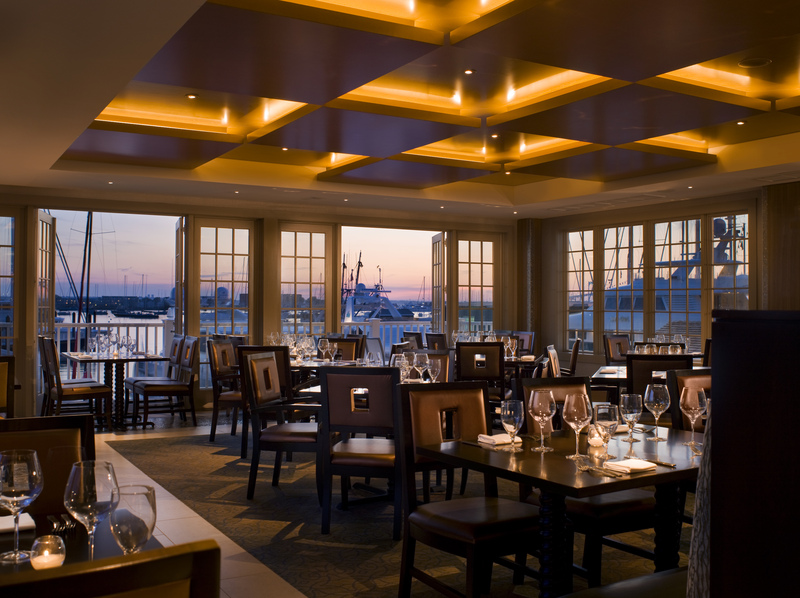 Because Newport, Rhode Island has long been one of the most fashionable escapes for America's über wealthy. Never more so was this the case than at the dawn of the 20th century when New York society's ruling families, the famous 400 as they were called at the time, were dominated by the Vanderbilts and the Astors, who built their now legendary "summer cottages" on the shores of what would become the blueblood mecca. Known as the Gilded Age, this period saw a veritable frenzy of building that resulted in some of the most resplendent residential architecture ever seen in America before or since. Now, there are those who point to these indulgently opulent mansions, which required enormous staff and were used a scant eight weeks annually (if that) by the grand families that built them, as vulgar displays of wealth that only serve to highlight the huge disparities that existed in America at a time when there was no income tax, few regulations and even fewer employment laws. And I will not argue that point. However, I see these homes in a slightly different light. I actually quite admire these palatial spreads and the chutzpah of the men and women who dared to build them. They are to my eyes as much monuments to America's growing standing in the world at the turn of the twentieth century as they are to the success of the families that commissioned and decorated them, particularly as many of the fortunes that supported them were earned by self-made men barely a generation before. 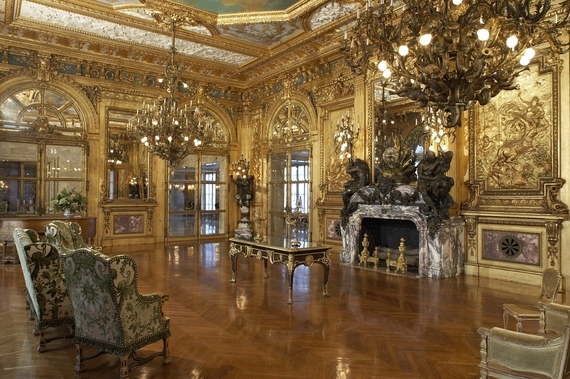 Take John Jacob Astor who built the Astor family fortune on fur-trading in the early 19th century or Cornelius "Commodore" Vanderbilt, a man with little formal education, who began to sow the seeds of his fortune around the same time with a single ferry that he captained himself before becoming a steamboat entrepreneur and ultimately the wealthiest man in the world. Taking into account the fact that America was largely seen as a backwards and unsophisticated country by most of Europe in the late 19th century, it can be said that the magnificent homes that came to be erected along and around Newport's famed Bellevue Avenue, with all their grandeur, fine antiques and paintings by old masters began to write a new narrative about life in America. It was a narrative that challenged jibes about the former colonies from the likes of Oscar Wilde who joked that "America is the only country that went from barbarism to decadence without civilization in between," while simultaneously defining the possibility and promise of America along with the value of American ingenuity and entrepreneurship. And perhaps, most significantly to society at the time, it was a narrative that brought the leading lights of the European aristocracy to American shores and left them in awe. More than a century later, on a tour of a selection of the mansions preserved from the wrecking ball by the Preservation Society of Newport, I felt what can only be described as a similar sense of wonder. How could I not in the face of such awe-inspiring splendor? 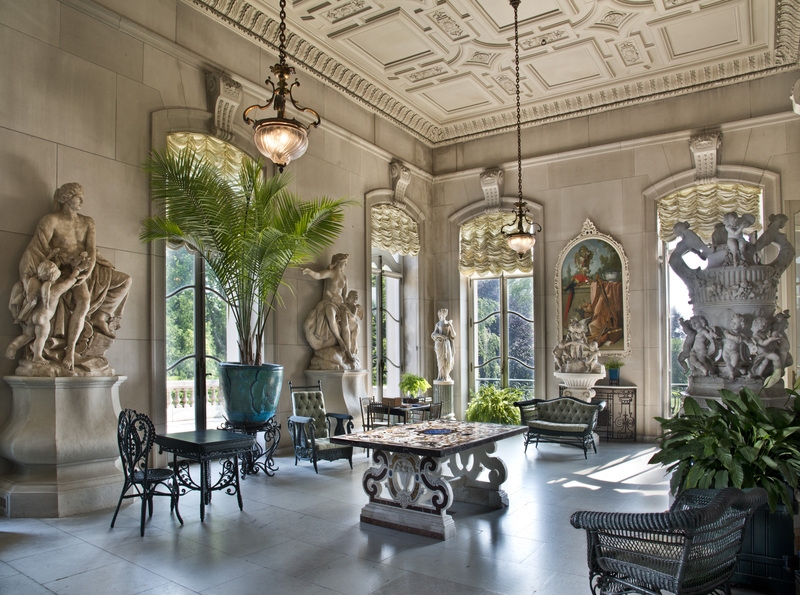 Because of a long held fascination with the social machinations of Alva (the former Mrs. William K.) Vanderbilt, I began my tour at Marble House. Alva Vanderbilt (later Alva Belmont) was the outspoken women's suffragette who, in her prime, outmaneuvered and outspent Caroline Astor, the then reigning queen of New York society, to secure a place for herself atop the 400. 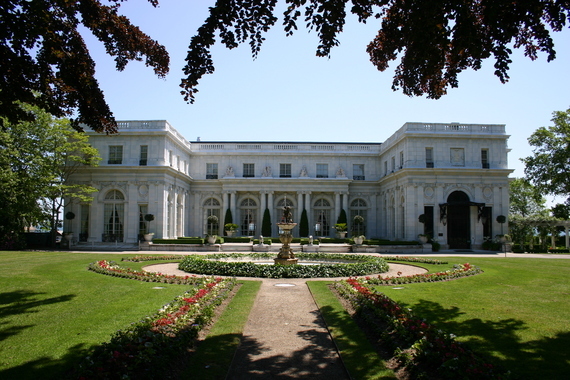 Mrs. Vanderbilt's Beaux Arts marble palace by the sea not only completed her ascent to heights of society, it arguably changed the architectural fashion of the seaside community and began the transformation of Newport when it was completed in 1892 at the staggering cost of $11 million (approximately $291 million in 2014 dollars). Ornate, dark and opulent beyond words, the Richard Morris Hunt designed structure is a marvel to take in, if only because it is so apparent that no expense was spared in its construction. That said, given the extensive use of marble in the construction, it is not a house that is, shall we say, bursting with warmth or feeling. Which probably explains why the Vanderbilt's three children reportedly didn't much care for the house and also why the Mr. William K. Vanderbilts only used the house for a few seasons before divorcing, at which time Alva Vanderbilt remarried and moved into another house down the street, only using the Chinese Tea House at Marble House periodically thereafter for women's rights rallies. 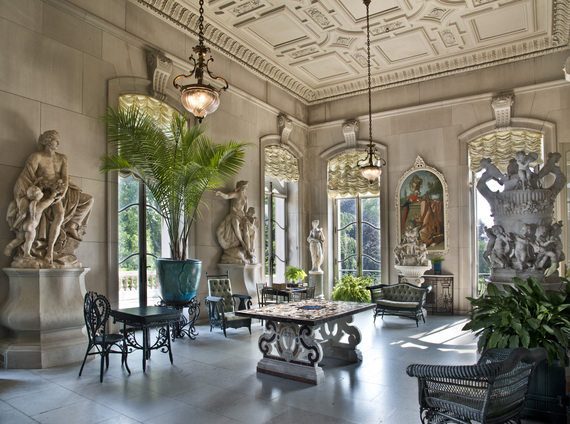 I suppose in the final analysis, a "temple to the arts" as Alva Vanderbilt would famously describe the house, though magnificent to behold, does not necessarily a home make. 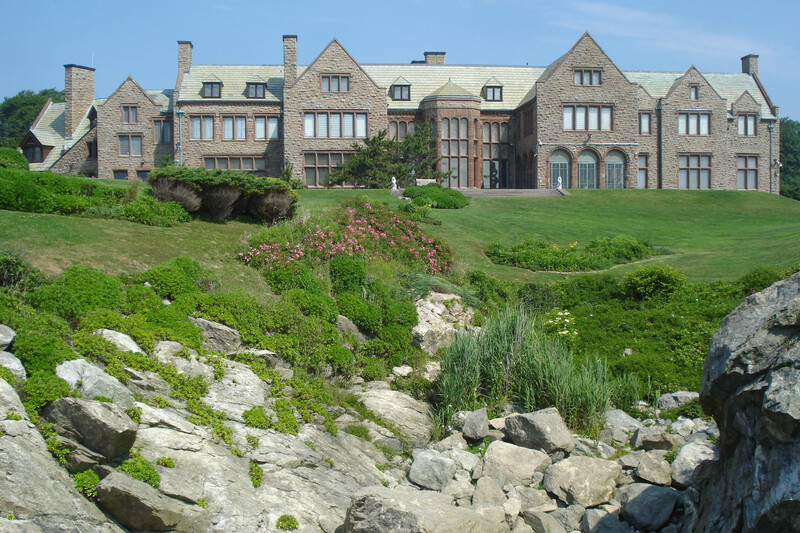 The next stop on my tour was The Breakers, the grandest of the Newport "summer cottages" with more than 70 rooms and over 130,000 square feet. The house was also designed by Richard Morris Hunt for another arm of the Vanderbilt clan, Mr. and Mrs. Cornelius Vanderbilt, with whom Alva Vanderbilt was allegedly famously competitive. Less oppressive and more open (though no less ornate) with spectacular views of the ocean, The Breakers is much more inviting home than Marble House despite being nothing short of an American palace. It is a must see, if only for its sheer scale and majesty as well as the feeling of having set foot on the set of a classic George Cukor film. Beyond the historic mansions and their wonders, a new chapter is being written in the narrative of the patrician capitol of Rhode Island that continues the theme that began more than a hundred years ago. 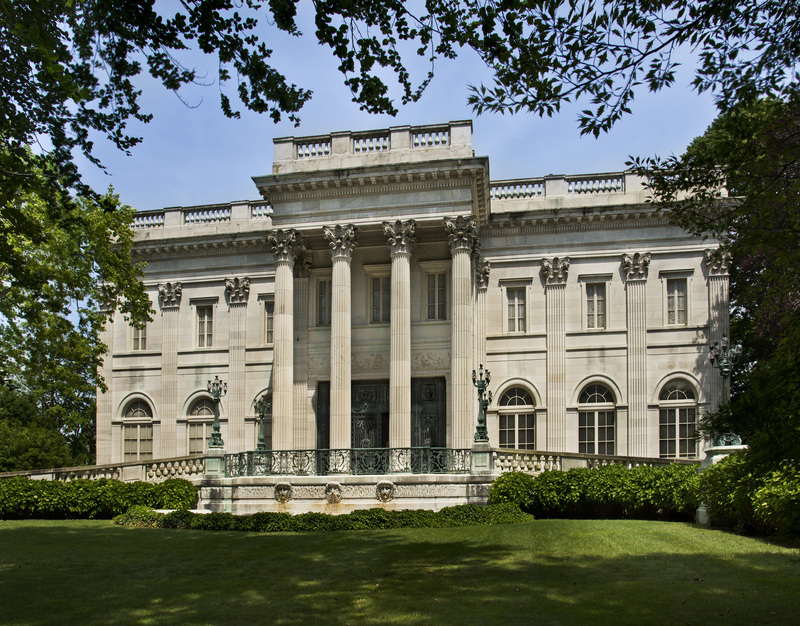 A modern Gilded Age is arriving in Newport as the next generation of the self-made super-rich like Oracle's Larry Ellison snap up Gilded Era homes like the Astor's famed Beechwood estate, formerly open to the public, and restore them to private use. Ditto for Hammersmith Farm, the childhood home of Jacqueline Onassis, which is now privately owned by a former partner from Goldman Sachs, and Wildacre, the manse built for Albert H. Olmsted and most recently owned by Campbell Soup heiress Dorrance Hamilton, which was also recently sold. Even Hollywood has come calling with Taylor Swift plunking down nearly $18 million in cash for a waterfront spread in nearby Westerly. 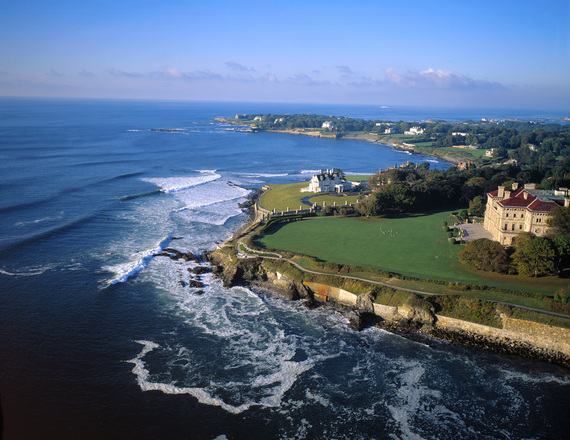 The year may have changed but the stories remain remarkably similar as a wave of new money returns an almost palpable buzz to the original summer enclave of the mega-rich bringing it back to favor as an alternative to the Hamptons and Nantucket. And just as you might expect, there is accompanying this second coming a boon in eateries and shops which during the season are, like the town itself, packed to the gills with tourists and weekend regulars who flock to Newport to enjoy its temperate weather, historic charm and enchanting vistas. Whether you pop into The Grill at Forty 1° North for a swanky dockside brunch or slip into the more casual 22 Bowen's Wine Bar & Grille for a casual lunch or dinner, you are certain to find that just as the old has sparked new interest, so do Newport's latest additions complement and revitalize the qualities that have not only made this bejeweled stretch of coast a testament to the American dream but kept it in favor for so very long. Find out more about Newport at www.discovernewport.org.